Tuna formulated for humans should not be fed regularly to cats because it can trigger a vitamin E deficiency, which in turn can cause an extremely painful and potentially life-threatening condition called steatitis (yellow fat disease). Tuna is low in vitamin E, and because it’s so rich in unsaturated fats, it can also destroy existing vitamin E in a cat’s body. Tuna formulated for cats is not dangerous in this way because any reputable brand will contain many other ingredients cats require for a nutritionally balanced diet and be fortified with vitamin E.
Steatitis symptoms include greasy/dull coat, loss of appetite, high fever, and unwillingness to be touched or even move due to pain. Young-to-middle-aged cats are more vulnerable to the disease. Other feline health problems caused by feeding tuna as a dietary staple include deficiencies in various additional nutrients, including other vitamins, calcium, copper, iron, sodium. These deficiencies occur because tuna made for humans has been deboned and it’s not supplemented to replenish the vitamins and minerals that are lost with the bone. 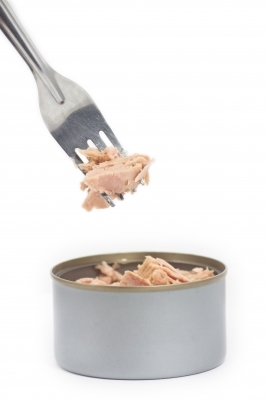 A final problem associated with tuna is its mercury content. This is unlikely to be a concern with infrequent feeding of tuna, but cats that eat tuna daily may suffer health problems due to mercury accumulation. Tuna formulated for humans is fine as an occasional treat because it’s unlikely to cause any problems for cats that otherwise eat a nutritionally balanced diet. However, it shouldn’t be fed on a daily basis. Lenawee Humane Society. (2006). “We’re Talking Tuna: How Much Is too Much for Your Cat?” Lenhumanesoc.org. PetMD. (n.d.). “Fatty Tissue Inflammation in Cats.” PetMD.com. Second Chance Sanctuary. (n.d.). “Steatitis/Yellow Fat Disease.” SecondChanceCats.org.